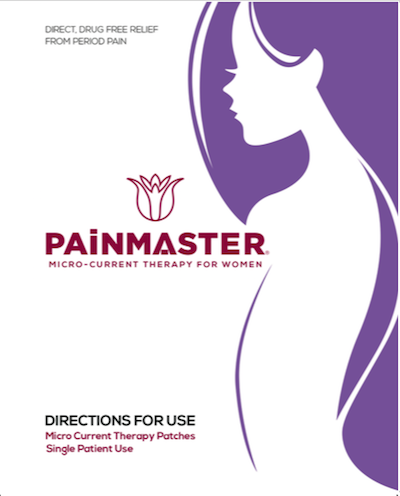 The use of low-level electrical stimulation for pain relief is not a new treatment. It has been used for years by athletic trainers and physical therapists to relieve pain from injuries and chronic muscle and skeletal discomfort. Those treatments are administered in an office using large machines. 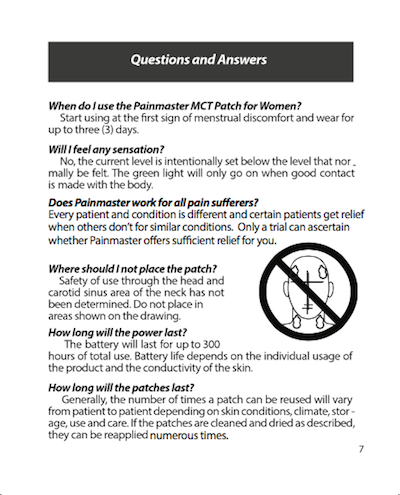 What is new is the Painmaster MCT innovative patch system, which delivers 24-hour-a-day relief using electronic patches worn under your clothing, unseen by others. 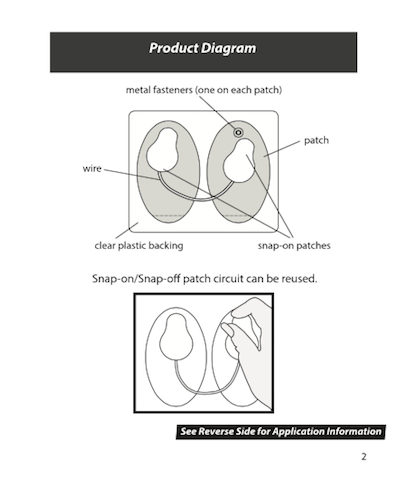 The patches look like the electrodes used in a doctor’s office for administering electrocardiograms. They are applied and removed just as effortlessly. 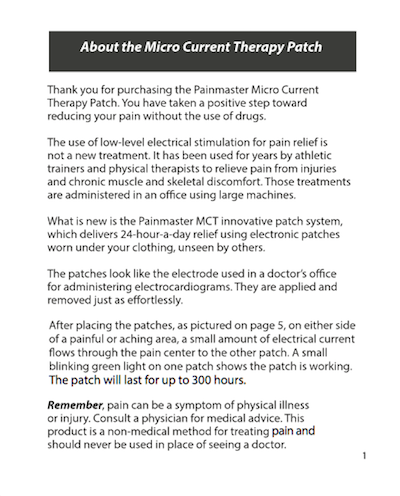 After placing the patches on either side of a painful or aching area, a very small amount of electrical current flows through the pain center to the other patch. A small red light on one patch shows the patch is working. 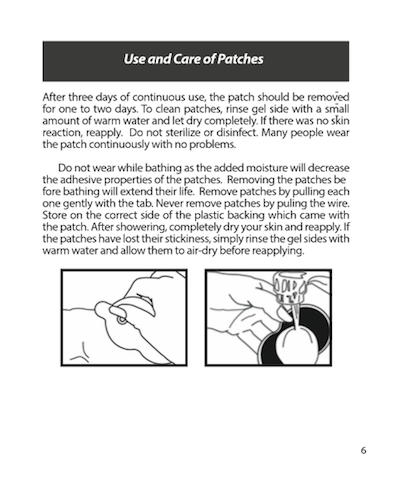 The patch typically is effective for 250 hours of use. Remember, pain can be a symptom of physical illness or injury. Consult a physician for medical advice. 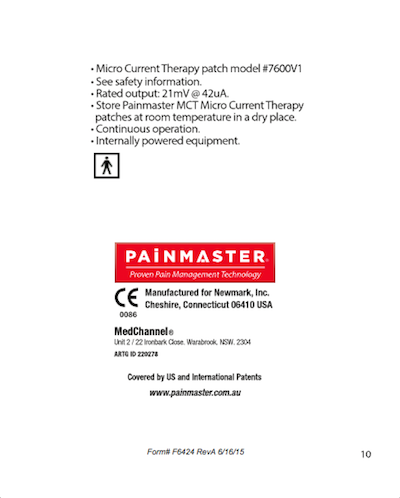 This product is a non-medical method for treating pain and should never be used in place of seeing a doctor. 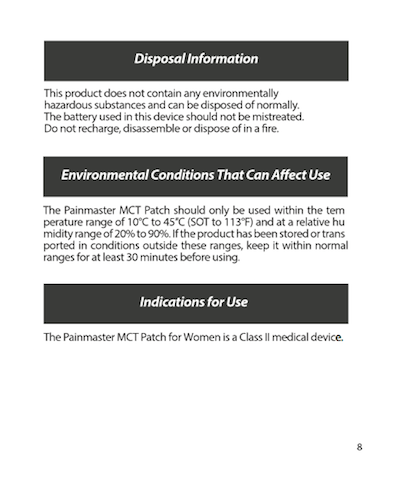 Anyone using Transdermal Drug Delivery like heart medication delivery patches. Anyone under the age of 12 unless under the continued supervision of a physician. 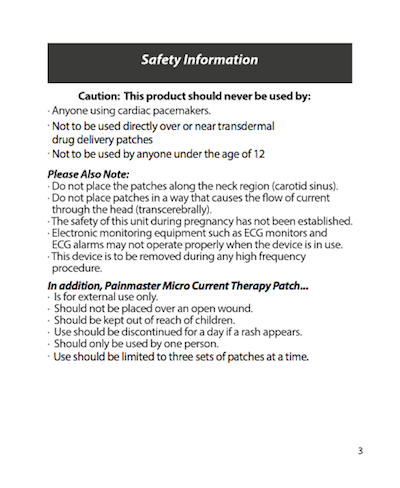 Do not place the patches along the neck region (carotid sinus). 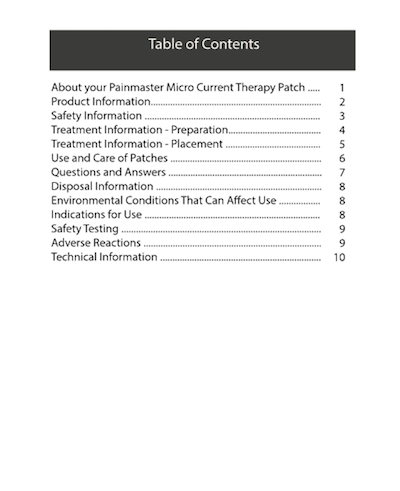 Do not place patches in a way that causes the flow of current through the head (transcerebrally). The safety of this unit during pregnancy has not been established. Electronic monitoring equipment such as ECG monitors and ECG alarms may not operate properly when the device is in use. This device is to be removed during any high frequency procedure. Is for external use only. Should not be placed over an open wound. 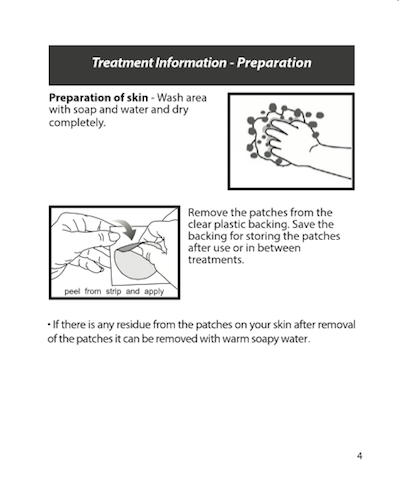 Use should be discontinued for a day if a rash appears. Should only be used by one person. Use should be limited to no more than three sets of patches at one time. 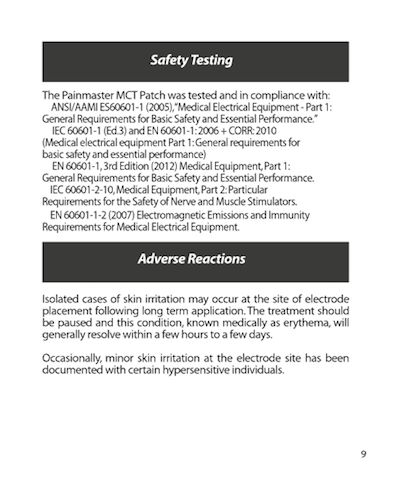 This product does not contain any environmentally hazardous substances and can be disposed of normally. The battery used in this device should not be mistreated. Do not recharge, disassemble or dispose of in a fire.